(Left) Historic Charleston Foundation (HCF) found original plaster hiding behind 20th-century drywall in former enslaved living quarters at the Nathaniel Russell House Museum. (Right) HCF’s Lauren Northup holds part of an enslaved butler’s wool and silk livery waistcoat, complete with brass buttons. Sunlight raked across a door in the kitchen house of the Nathaniel Russell House Museum. The second-floor space was once enslaved living quarters, but on that spring 2017 day, it was the office of Lauren Northup, Historic Charleston Foundation’s (HCF) director of museums. When Northup glanced up that morning, she noticed an unevenness in the door’s white-painted surface—evidence that someone, centuries ago, had planed the wood by hand. For three decades, HCF had been working to restore the main house to its 1808 grandeur, but historians believed that the original fabric of the kitchen house was long gone. Here, a sign to the contrary. Northup called in Virginia-based conservator and paint analyst Susan Buck, who carefully sampled layers of paint from the door, trim work, and window sashes, uncovering fine craftsmanship details that very likely meant all were “first generation” to the building. “Within six hours, this room transformed from my office into an incredibly important historic site,” says Northup. 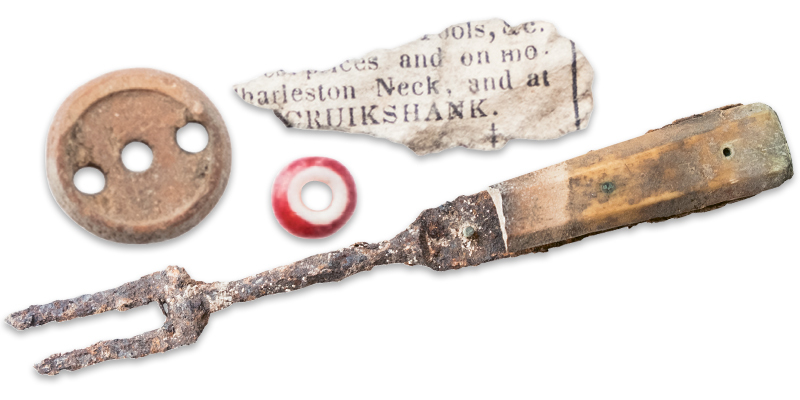 Found artifacts include a glass bead, a fork, and the newspaper fragment that dated one rat’s nest to 1839. To delve deeper, HCF brought together legendary architectural historian Ed Chappell (Buck’s husband) and David Hoffman, the contractor whose historical renovation expertise also factors into this issue’s Local Seen, “Digging In.” Hoffman cut a hole into the room’s 20th-century drywall, and a flashlight’s ray revealed plaster—the plaster of a miraculously intact 1808 wall. Slowly, he unmasked the entire wall, and another, both limewashed yellow. Knowing these were the very surfaces enslaved residents touched, “I cried,” Northup recalls. As they began opening the third wall, disappointment set in: the plaster was gone. But then they spied rubble. And artifacts. A fragment of an enslaved butler’s waistcoat, colorful calico, a scrap from a reading primer (“Someone in this space was learning to read and write at a time when it was illegal for enslaved people to do so,” says Northup): each was preserved within a rat’s nest built circa-1839. Prying further into hidden spaces, the team discovered more jaw-dropping evidence of how enslaved individuals dressed, ate, and even spent precious off-hours; Northup describes the artifacts on HCF’s Instagram feed in goosebump-inducing detail. “It’s incredibly rare to find a time capsule like this, especially in an enslaved living area,” she says. “It gives such a full picture of daily life for people whose histories do not exist in the written record.” On November 14, the first event in a six-part Art & Architecture Study Series ($400) offers the public a chance to join Northup, Buck, Chappell, and Hoffman for a tour.